I had in mind another post for today, but the circumstances made me change my mind. This morning, my 4 months old Lenovo IdeaPad U350 crashed. It was not a hardware problem – Lenovo still makes some of the best laptops out there – but a software problem. A problem with Windows 7, to be precise. I was very happy with Windows 7 lately and I was convinced they had finally done something that works very well for the first time since Windows 3.1 – with Windows XP they got something that worked decently well as well -. But I was just being fooled by a flawless functionality for the last 4 months and some fancy commercials on TV. I will still be a Windows user, but Windows will always be Windows. And that means unreliability and a constant likelihood of you computer crashing, no matter how new or old it is. The problem was odd. I logged in my user and everything looked wrong and I couldn’t see any of my files. Rebooted and, from then on, every time I would try to log into my computer, it would pop up a message saying that it was unable to bring up my user data. And that’s it. It wouldn’t log in. The computer was useless. 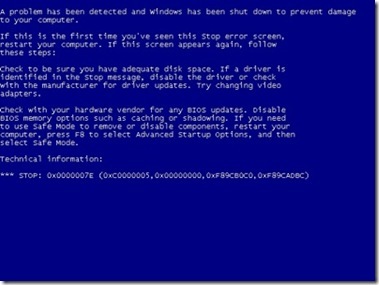 Eventually I got one of the feared blue screens. I find simply stupid that, a Windows 7 system, when the only user can’t log in because of an OS problem, it does not give you the choice to log in to fix the problem or to create another user. Anyhow, lucky me I am and will always be a geek. Each time I have had a computer crashing – yes, you guessed right, always happened with Windows platforms – I fixed it myself and recovered all my data – no matter how badly it crashed – thanks to Knoppix. Knoppix is a simple Linux based OS that boots from the CD unit. It has a very simple to use graphic interface, very similar to Windows. If an external hard drive – or other USB devices – are plugged in, it mounts them and allows you to use them. Therefore, one can save all the data in the computer’s hard drive to an external unit and then safely reinstall Windows. I always thought of reinstalling Windows like ordering animal style fries at In’n’Out. You get them and they mess up your stomach. But the next time you go to In’n’Out you order them again. Download here an ISO for a Knoppix CD and make sure you always have it with you.